Information Pursuant to art. 13 of Regulation (EU) 679/2016, concerning the protection of natural persons with regard to the processing of Personal Data (hereinafter "GDPR") With reference to the European Union regulation 679/2016, hereinafter "GDPR", especially to art. 13, we hereby supply you all due information concerning the processing of your personal data. What data do we process? (art. 13, 1 paragraph, letter a, art. 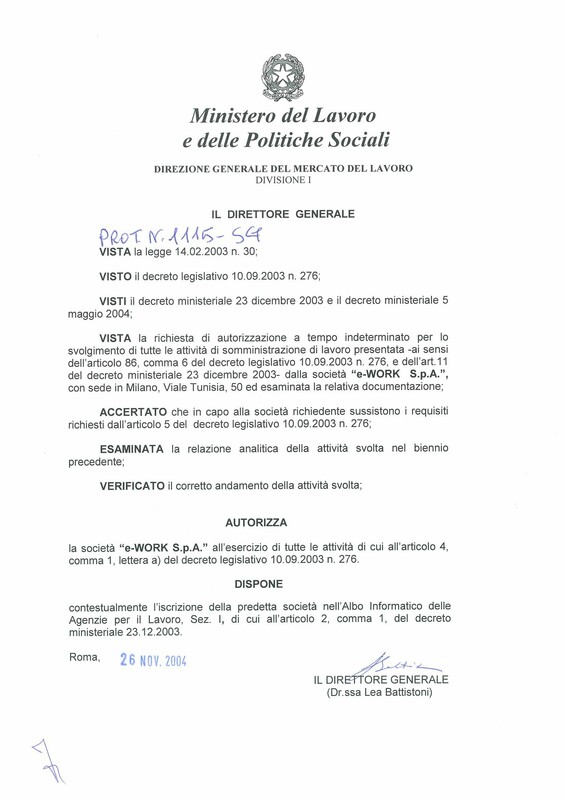 15, letter b, GDPR) The website http://www.e-workspa.it/ is owned by e-work spa , which is based in Milano, via Cola Montano 32 and is the processor of data, such as: 1. Data entered by filling out the registration form (name, surname, tax code, birth city and date, address and email address, telephone and mobile number, data regarding your career path or those information you disclosed in your resume as well as regarding your health condition; 2. Data concerning the navigation on our website, ex. traffic related data, location, website visits, weblog, IP address, the operating system and the browser used, cookies; 3. Data you supply us via email, survey as well as via our contact modules. Why do we need your data? (art. 13, 1 paragraph, letter c, d, e, f, GDPR) We use your data to accomplish your placement as well as the GDPR. Your data are specifically processed for: 1. The activities concerning the intermediation between labour supply and demand, the search and selection of personnel, outplacement as well as training. The legal basis of such activities is the accomplishment of pre-contractual and contractual requirements in which you take part as well as the compliance with the law. 2. The activities aimed to optimize the services outlined at point 1), which are delivered both online and offline by the owner. The legal basis of such activities is the accomplishment of pre-contractual and contractual requirements in which you take part as well as the owner’s legitimate interest. 3. The activities with commercial purposes, the sending of information, newsletters, surveys as well as of messages from the customer service. The legal basis of such activities is your consent to the processing of your data, which you are allowed to revoke at any time. 4. The sharing of your data with our clients who are in search of personnel as well as with those public and private subjects by which the owner was charged of one of the activities mentioned at point 1). In addition to that, your data are transmitted to the organizations and private individuals supporting the owner with the delivery of services, such as network services, software, advertising, etc.). At last your data can be transmitted through the owner’s website or some other staffing services only with the purpose of accomplishing the service related contractual requirements at any time. The legal basis of such activities is the accomplishment of pre-contractual and contractual requirements related to the service as well as the existence of specific legal obligations. What happens if you do not supply us your data? (art. 13, 2 paragraph, letter e, GDPR) The collection and processing of your personal data is necessary to accomplish any staffing service as well as the GDPR. The lack of authorization to process them does not enable the owner to manage the contract. How long are your data stored? (art. 13, 2 paragraph, letter a, GDPR) Your personal data will be stored so long as it takes to accomplish the tasks related to the contract management as well as any resulting legal obligation. The data stored on the owner’s website will be deleted after 12 months inactivity. 3 months before the expiration date you will receive an email notification. How do we process your personal data? (art. 13, 2 paragraph, letter f, GDPR) The processing of your personal data is performed or digitally or on paper by some people who are internally authorized and trained for that. The processing of those data does not include the automated decision-making but involves the profiling for the activities related to the navigation on the website through technical tools such as cookies. What are your rights? (art. 13, 1 paragraph, letter b, 2 paragraph, letter b, GDPR) At any time you can request the owner for free and without any further formality being required: •	The confirmation of the processing of your personal data; •	The access to your personal data and disclosure of their source (if they were not transmitted by you), of the purposes for the processing, of information on the individuals/organizations those data are transmitted to, the retention period and the criteria to define it; •	The possibility to update and rectify your data in order to guarantee their accuracy; •	The possibility to delete, to the extent permitted, your personal data as well as to limit the processing of them; Any request is processed not later than a month after the reception of it, with prejudice to the possibility to extend that deadline by two months, if necessary, considering the complexity and amount of requests received by the owner. Please contact the owner on privacy@e-workspa.it for more information as well as to request the list of the external authorities responsible for the processing of your data. To whom can you make a compliant? (art. 13, 2 paragraph, letter d, GDPR) If you live in Italy you can make a compliant to the Data Protection Officer (DPO) in Italy, as long as a competent authority from an other European Union country or from Switzerland is responsible for your case.